Search for an alluring Indochina city owning breathtaking scenery, long-established religion, and unique culture? Luang Prabang is absolutely for you. 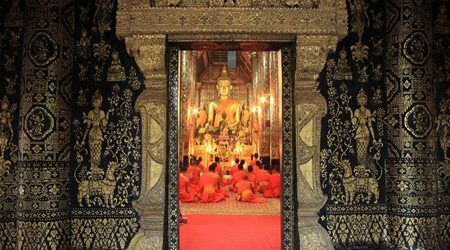 Luang Prabang tours will open the amazing explorations to a UNESCO World Heritage Site with a rich mix of Buddhist and French colonial architectures. In the map of the world tourism, Luang Prabang is still a secret of untouched nature including mysterious caves, dreaming waterfalls, pristine jungles, and scattered traditional villages along Mekong River. 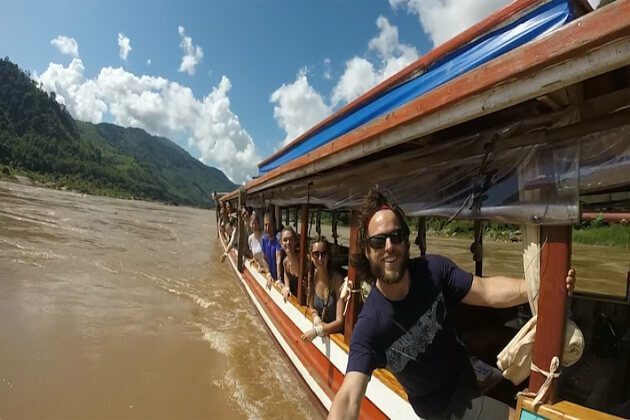 During your Laos Vacation, we make a wide range of Luang Prabang tour packages offering the most wonderful experiences, Laotians can no longer keep this astonishing city themselves. Luang Prabang tours only need time to be perfect because of an overload of attractions and impressions standing in this tiny city. 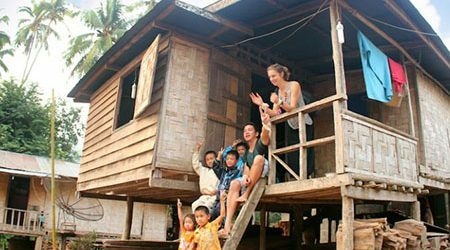 In order not to waste your time spending on consideration where to go during Luang Prabang tours, Go Laos tours will provide a list of the 10 best things which should not be missed when visiting this destination. 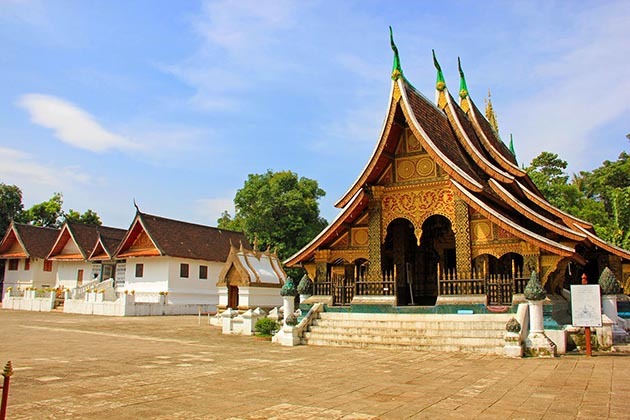 The most famous temple in the city, impossible to visit Luang Prabang without passing! This temple is located at the end of the peninsula. This temple was built in the 16th century and perfectly represents the traditional architecture of Buddhist temples in Laos. 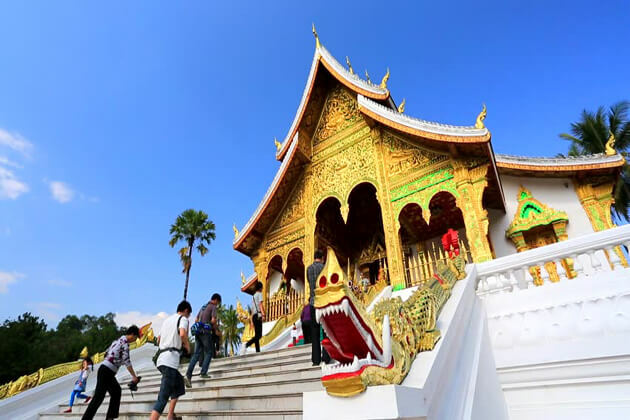 It is also one of the most visited temples in Luang Prabang tours, so it's best to go in the early morning or at the end of the day to avoid crowded people. 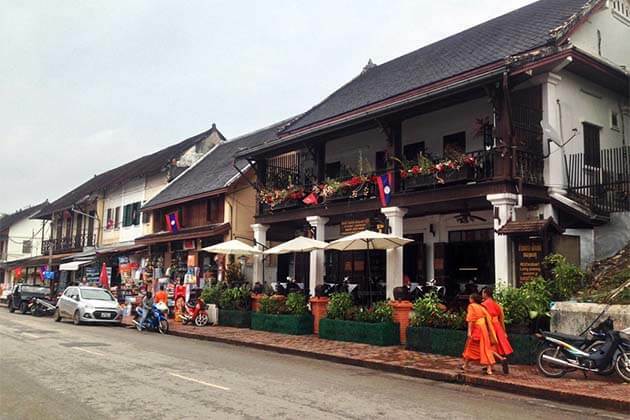 What to do in Luang Prabang tours after attending the tak bat? Go to the morning market of the old city. 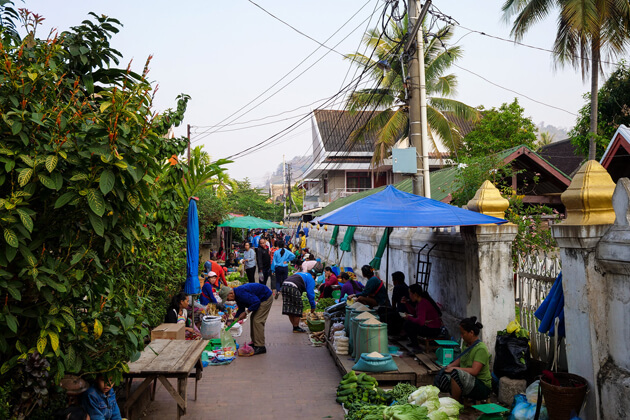 This authentic Luang Prabang market starts early in the morning. At 5 o'clock in the morning, there are already locals in this market. The perfect time to go is after the tak bat. It is also a very good time to visit Luang Prabang. Most tourists return to their hotel directly for breakfast. You then have the city for you! Mount Phousi is located at the entrance to the Luang Prabang Peninsula. There are two possible accesses, by the main street of the old city, the Sisavangvong street or then on the other side of the mount. To climb to the top of Mount Phousi, you have to climb about 300 steps! At the top of the mountain, the view is clearer because Mount Phousi dominates largely the city. You can see the Mekong, the city of Luang Prabang and in the background, the surrounding mountains. 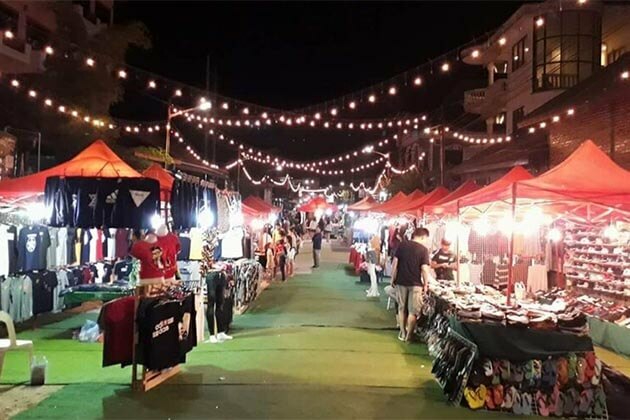 The night market invades part of the main street of Luang Prabang as soon as it gets dark. Dozens of merchants sell products from Laotian handicrafts. The night market remains pleasant and you have to go at least once during your Luang Prabang tour. It stretches for about 400 meters, on Sisavangvong Street, facing Mount Phousi. 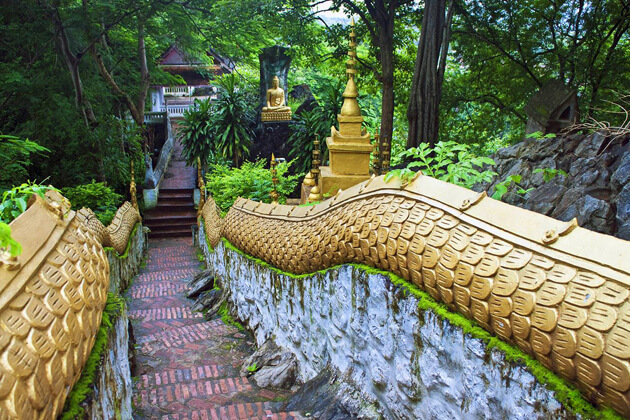 Wat Visounnarath is located outside the Luang Prabang Peninsula. This temple was demolished by the Black Pavilions and was rebuilt at the end of the 19th century. Inside the main building, there is a beautiful collection of golden Buddha statues. Right in front of this building, you will not be able to miss the That Makmo, a large pagoda dating from 1514. The Royal Palace of Luang Prabang is one of the most visited monuments of the city! It was built at the beginning of the twentieth century, the colonial era and it was the palace of King Sisavang Vong. 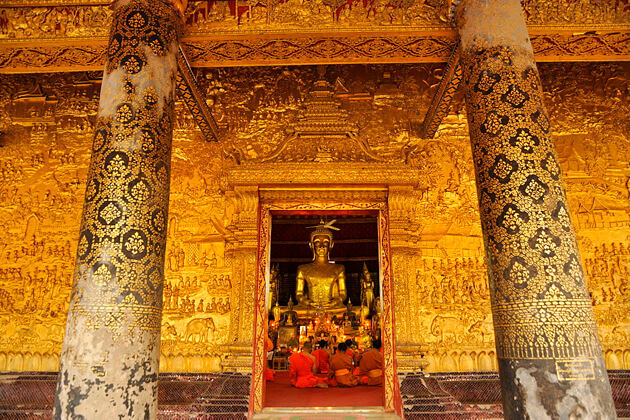 Do not miss the Royal Palace, the Haw Pha Bang which houses the most venerated Buddha statues of Laos. The name of this statue is Phra Bang. Wat Mai, built in the late 18th century, is the largest temple in Luang Prabang. Located near the Royal Palace, it stands out especially for its impressive roof! It is located on Sisavangvong road. 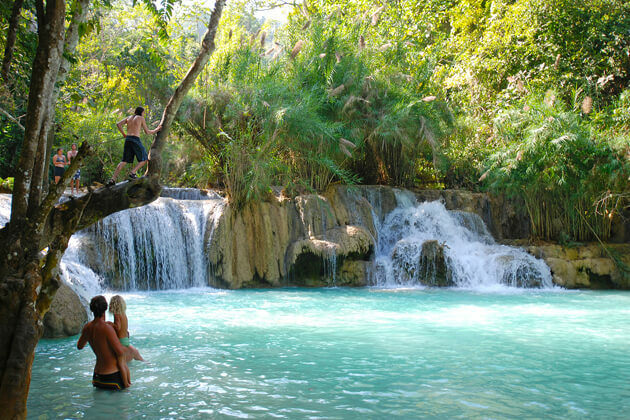 The Kuang Si Waterfalls are located 30 kilometers to the southwest of Luang Prabang. It takes about an hour tuk-tuk to get there and the ride is not particularly comfortable ... 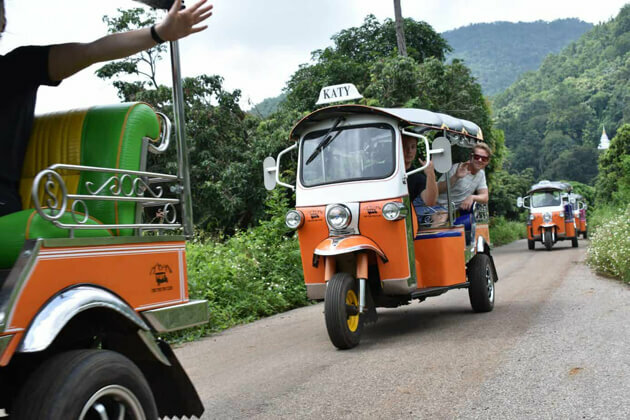 Negotiate the tuk-tuk ride with any tuk-tuk from Luang Prabang. 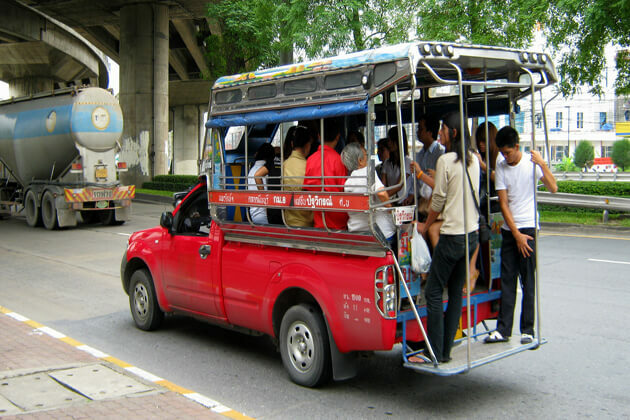 You should go for 200,000 kips return for the tuk-tuk, regardless of the number of people. 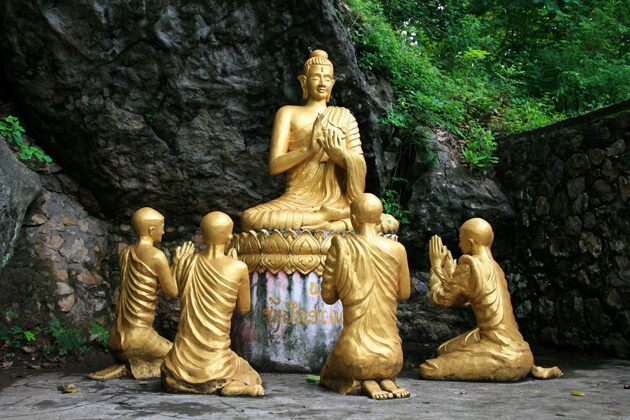 The Pak Ou Caves are located in the north of Luang Prabang, about 30 kilometers away. The Nam Ou River, a tributary of the Mekong, flows into the Mekong River at Pak Ou caves. These caves are known to house hundreds of Buddha statues. A visit is not unavoidable but is still nice, especially if you go by boat from Luang Prabang. The opportunity to spend time on the Mekong if you do not plan to cruise on the river! The morning prayer is too early in the morning. Nevertheless, it is quite easy to attend the end-of-day prayer, which unfolds more or less at sunset time. For example, after watching the sunset at the top of Mount Phousi, you can go to Wat Mai just near the stairs of Mount Phousi. At the end of the day, the entrance of the temple is no longer charged and you can attend the prayer. Although the temple is very touristy, at this time of the day, there is only a handful of tourists who attend the prayer. To sum up, what is mentioned to visit Luang Prabang and its surroundings, these 10 things/places must absolutely appear in your to-do list within your Luang Prabang tour! Climb to the top of Mount Phousi to admire the sunset over the mountains surrounding the Mekong. 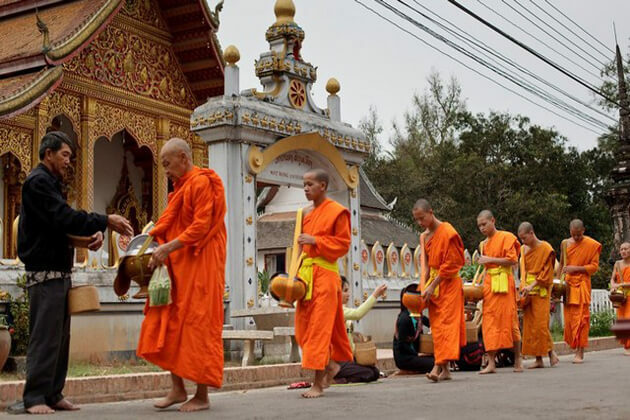 Attend the tak bat, morning alms of the monks of Luang Prabang. 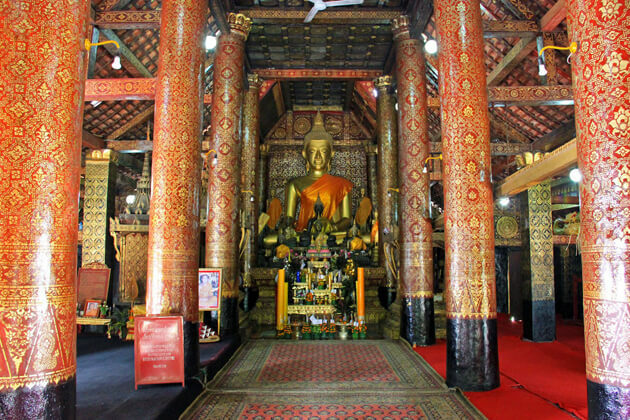 Visit Wat Xieng Thong, considered the most beautiful temple in Luang Prabang tours and Laos! Discover Ban Xieng Man, a small village in front of Luang Prabang and forgotten tourist sites. Have a walk without a real purpose in the alleys of the peninsula of Luang Prabang and enter temples little visited, at random. The monsoon that affects the entire Southeast Asian sub-continent generates annually three major climatic periods, with the alternating dry season and rainy season. The Southwestern monsoon settles between May and July and lasts until November. The average rainfall varies considerably according to latitude and altitude. The southern peaks of the Annamite Cordillera receive the highest rainfall, with more 300 centimeters a year, against 100 to 150 centimeters for the provinces of Luang Prabang, Sayabouri and Xieng Khuang. Vientiane and Savannakhet, as well as Phong Saly Luang Nam Tha and Bokeo, receive between 150 and 200 centimeters of rain per year. Between November and May, the monsoon gives way to the dry season. This period is characterized by relatively low temperatures (due to the influences of the Northeast Asian monsoon which spares Laos but causes cold winds) until mid-February. After the passage of the monsoon winter, temperatures rise from March to May. Like precipitation, temperatures vary with altitude. In the Mekong Valley, from Bokeo province to Champasak province, as in most regions of Thailand and Myanmar, the highest temperatures appear in March and April (up to 38 ° C) and the lowest in December and January (15° C). During these two months, the thermometer drops easily to 0° C at night in the mountainous province of Xieng Khuang; in the lower provinces, it can be between 5 and 10 degrees higher. During the longest rainy season, the temperatures of the day are around 29 ° C in the lowlands and around 25 ° C in the high valleys. In Luang Prabang, during most of the rainy season, the temperatures of the day are around 30ºC. 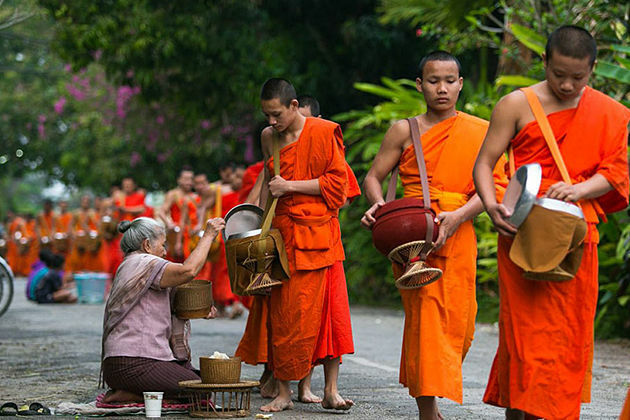 The months of November to March are the best months to visit Luang Prabang. It is the dry season in Laos, the temperatures are lower and especially it does not rain during these months. Although the air remains humid, the temperature is much more suitable than in summer! April to October corresponds more or less to the rainy season although the rainiest months are June/July/August which corresponds to the least favorable period for a Luang Prabang tour. Nevertheless, in South East Asia, it can only rarely rains all day. If you plan to visit Luang Prabang in the middle of the summer, it will be hot and humid, you will see heavy showers but that cannot prevent you from visiting the city. And even in the rain, if you wonder what to do in Luang Prabang, you will see that there is something to look after even during rainy days. Laos is one of the most depopulated countries in South-East Asia with nearly 5 million inhabitants (17 inhabitants per km2). 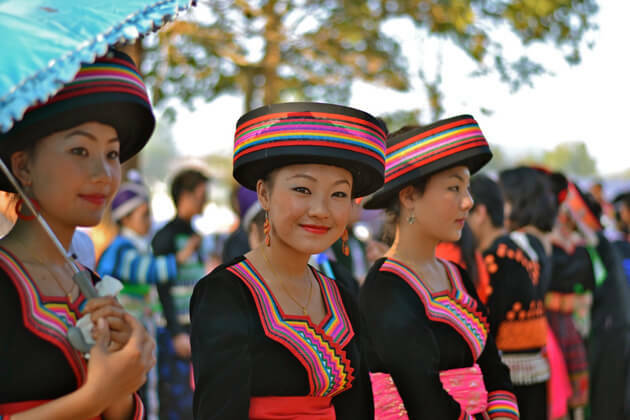 Laos has about 80 ethnic groups that can be grouped into 4 families. Each of them speaks their own dialect, own customs, traditions, religion, etc. 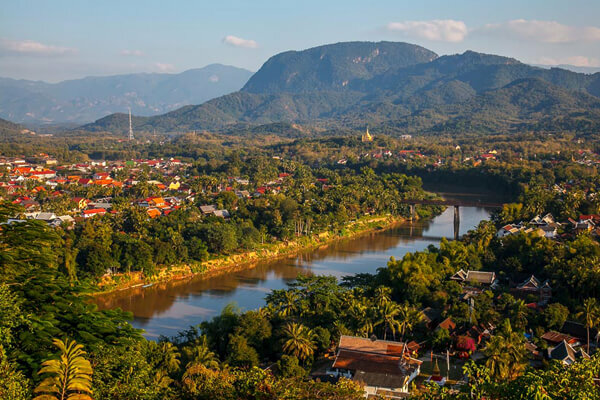 Located in the north of Laos, Luang Prabang city is the last big agglomerated zone of the country of this vast area bordering Thailand and Burma to the West, China to the North and Vietnam to the East. The city is the capital of the Province and the former capital of the kingdom of Luang Prabang. 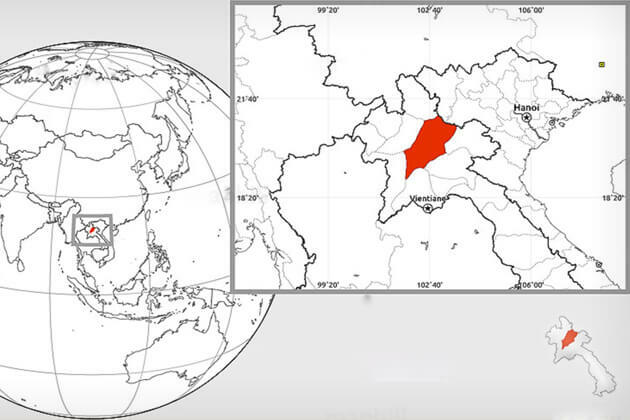 Located at the center of the northern part of Laos, in a mountainous area and at a point where to converge watersheds in northern Laos; therefore, the commercial circuits of the region, the city rises to the confluence of NamKhana and Mekong. 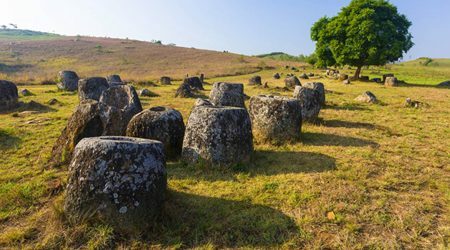 At this point, the two rivers draw a peninsula of 250 meters wide and one kilometer long, dominated by Phoussi, the sacred mountain of the Buddhist city, at the top of which is erected a that. 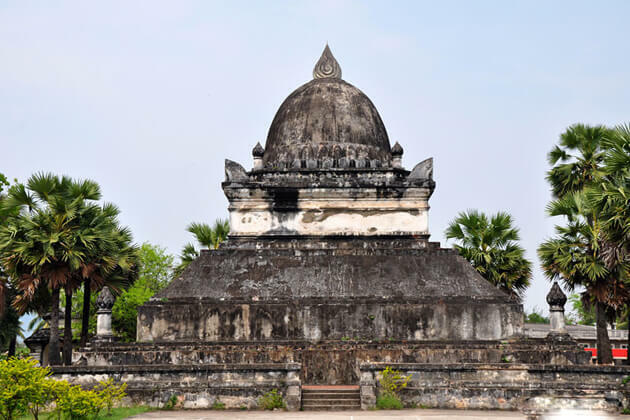 The culture of Luang Prabang is rich, singular, relatively preserved, probably because of its remoteness and the relative inaccessibility that has long characterized it. Classified in 1995 as World Heritage of Humanity for its unique architecture combining buildings harmoniously combining the 3 styles Lao, French and Chinese, and the presence of wetlands, the real lung of the city. The city is also a historical Buddhist center with a perennial and lively tradition, has developed a unique gastronomic culture partly based on bitterness, enjoys a beautiful geographical location with the characteristic of welcoming many elephants that live massively in the region. Lao Airlines is the main airline in Laos, assisted for destinations less frequented by Lao Air and Lao Capricorn. All domestic flights pass through Vientiane Airport. 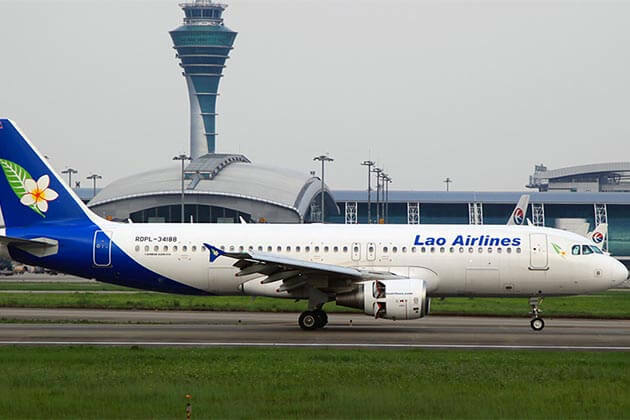 For the latest fares, visit the Lao Airlines website (www.laoairlines.com). Prices have changed little in recent years and are generally interesting. Tickets must be paid in dollars and cash, except at Lao Airline's branches in Vientiane and Luang Prabang, which accept credit card payments for international and domestic flights. National flights, especially from small airports such as Boun Neua (Phongsali) and Nathong (Sam Neua), are often canceled due to fog (March) or heavy smoke during the burning season. Some of these flights are only confirmed when the plane is in sight! During holidays, where flights are often full, it is advisable to book. The rest of the year, where the risks of cancellation are the most important, make you confirm one or two days in advance that the flight is well maintained. 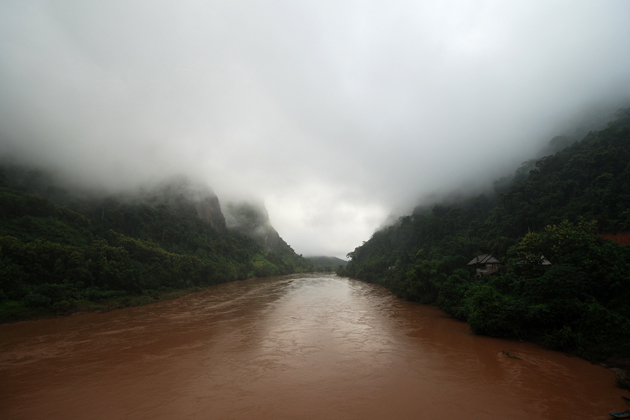 Rivers which are totally more than 4,600 km of waterways, constitute the traditional transportation network of Laos. The Mekong, Nam Ou, Nam Khan, Nam Tha, Nam Ngum and Se Kong form the main axes. 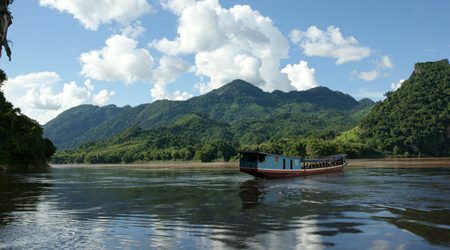 Navigable year-round (in theory, but more practically) from Luang Prabang in the north to Savannakhet in the south, the Mekong is the longest and most important river route. All kinds of small craft crisscross the more modest rivers, from canoes, dug into tree trunks to "bomb ships" made from bomb carcasses dropped during the Vietnam War. Regular boats have almost disappeared on the Mekong River, but with a bit of adventurous spirit, you can still travel by boat on small rivers in more remote places, and this is always a memorable moment. In any case, whether you're taking a tourist boat from Huay Xai to Luang Prabang or a local boat to a remote part of the country, do not miss a trip along the water during your stay in Laos. Particularly appreciated, the slow boat between Huay Xai and Luang Prabang runs daily. It remains relatively cheap, at around US$ 24 per person for two days of travel. From Huay Xai, the boats are often full and sometimes overcrowded, while in the other direction, you are likely to find places. Be aware however that comfort will be cursory. Most ferries were originally designed for the transport of goods, and furniture. For short trips, from Luang Prabang to Pak Ou Caves, for example, it is better to take a river taxi. The most common are the héua hang nyáo (traditional boats), but, for very short crossings, one can also take a héua phái (rowing boat) or a small improvised ferry. Hang nyáo héua that can carry eight to ten people cost about 10 USD an hour. On the upper Mekong River, between Huay Xai and Vientiane, there are many Thai-made héua wái (outboards) capable of covering in 6 hours distances for which the ferry takes two days or more. It must be at least 30 USD an hour. However, for speedboats that provide a regular service, it is possible to share charges between passengers. These boats, however, hide a danger. Long distance public transport in Laos is provided by buses or Songthaew (literally, "two rows"), trucks or vans converted into passenger vehicles by the addition of benches on each side. Buses are more regular and road connections are increasing. Buses can now be reached almost inaccessible places a few years ago. On some busy routes - mainly on Route 13 and international routes - private operators offer faster and more luxurious air-conditioned buses, known as VIP buses, for twice the price of a normal bus. Better to reserve your place. For this, go to the local bus station or go to the pensions, more and more to sell tickets for a small commission. The Songthaew generally provides service to shorter routes within a given province. The villages of relative importance have at least one sâwngthâew, which travels about every day to the capital of the province. Like local buses, they stop on demand but are usually slower because they usually run on unpaved roads. The hitchhiking is a means of transport possible in Laos, even current, but never entirely safe. It is particularly disadvised for women: the fact of standing on the side of the road to signal to cars may be misinterpreted. If you decide to move in this way, try to target cars with a red license plate on a yellow background (private vehicle) or blue on a white background (international organizations and embassies), or freight trucks. Keep in mind that the hitchhiking is never safe in any country, and we do not recommend it. Travelers deciding to hitchhike must know that they may take a risk, low but real. It is better, in this case, to travel with two and to inform someone of your destination. Driving in Laos is easier than you think. Of course, the road infrastructure is not very sophisticated, but outside the major urban centers, traffic is very sparse and driving is a pleasure compared to Vietnam, China or Thailand. Bikers will find a lot of information on the Golden Triangle Rider website (www.gt-rider.com). Going on a motorbike is more and more popular with travelers. In the city you will not have 50 choices, usually, we do everything on foot and it's super nice (because it's very small). If you want to cover a greater distance the bike is very good because the old town has very low traffic. On the other hand attention of attention to tuk-tuks, the price of tuk-tuks in Luang Prabang is quite delusional.